This was another burger test recipe. For once I’m quite pleased with the photo that I took. 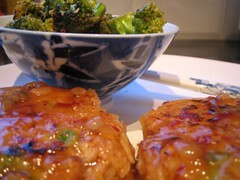 The burgers were fun too – based on cooked rice and tempeh and then coated in breadcrumbs and a sweet and sour glaze. I served it with some sesame broccoli from “Vegan Express” by Nava Atlas. It was a very good meal and included some vegetables on a Friday night, so I give myself a pat on the back for that!